Bluesound Pulse Soundbar 2i review | What Hi-Fi? For Bluesound, as with much of the rest of the world, 2018 has been a mixed year. The varying talents of its Generation 2i products led to it relinquishing its multi-room Product of the Year title, but the Canadian manufacturer did pick up What Hi-Fi? Awards for two of its speaker-less streamers. But, while many of the rest of its products have seen changes in their star ratings with this new iteration – for better or for worse – Bluesound has been nothing if not consistent with its Pulse Soundbar 2i: this is another highly capable upgrade on the native sound of your television, and one with multi-room streaming capabilities added into the bargain. At over a metre in length and standing 14cm tall, this is not a soundbar you’d expect to be lacking power. In fact, it has a total of 120W racing through its pairs of 25mm tweeters, 5cm midrange drivers and 10cm woofers – each driven by its own dedicated amplified channel and housed in individually optimised chambers – and that’s complemented by two 10cm passive radiators. The compromise for having that array of sizeable drivers is that the soundbar will block the bottom of a large proportion of screens. So unless your TV stands on long legs or has a shelf below it, you may struggle to accommodate the Bluesound. 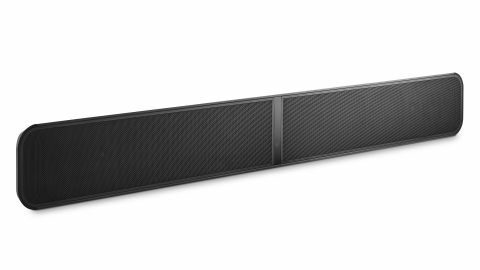 For those with the option of wall-mounting a soundbar, this could be your best bet. We’ve long been fans of Bluesound’s intuitive BluOS app – we’re now on version 3.0 to incorporate the upgrades in Generation 2i – but those who’d rather shout at their technology can connect their soundbar to an Amazon Echo product for Alexa compatibility. This is by no means a budget option for your home cinema, but you’re certainly getting what you pay for in terms of drivers. Being Bluesound, there is also enough tech on board to justify the considerable price tag. As part of the company’s multi-room family, you can link it up to any other Bluesound product around the house and control it via the BluOS Controller app. This includes creating a surround set-up alongside the Pulse Sub (£599) and a pair of four-star Pulse Flex 2i speakers (£299). But the Pulse Soundbar 2i can equally operate alone as an all-in-one home entertainment hub. It provides access to a host of free internet radio stations, as well as connecting to most major streaming services – including Spotify, Amazon Music, Tidal, Deezer and Qobuz – and Bluesound continues its trend of offering hi-res audio playback in FLAC, MQA, WAV and AIFF formats. Apple AirPlay 2 has also been added to this new generation, alongside Bluetooth aptX HD. In terms of physical connections, Bluesound offers ethernet alongside its dual-band wi-fi, USB types A and B, Optical, RCA and HDMI inputs and an output for that subwoofer. For those with the space to house it, the Pulse Soundbar 2i is worthy of an audition. Its predecessor wasn’t shy in its presentation, and there’s no change here. It’s as full-bodied a performance as you’d expect from those drivers, submerging the listener in a bold and widely dispersed soundfield that’s hard not to like. Most impressive, though, is the detail on offer. The substantial girth and presence of the midrange is dense with insight, laying out the timbre and tone of voices as competently as it renders the crashes and intensity of high-octane action. We’re treated to a well-balanced frequency range as well, with the Pulse Soundbar 2i’s tweeters working hard to provide a treble as rich and free as the substantial heft of its bass response. The versatility of adding further authority via the Pulse Sub should not go unmentioned, but it is far from a necessity; for most users, and in most rooms, there is enough low-end here to provide significant impact whatever your source material. Our only real qualm about the Pulse Soundbar 2i mirrors the reservations we had about its predecessor, in that it lacks the dynamic range, ultimate transparency and precision of class-leading rivals, such as the Award-winning Dali Kubik One. It isn’t that the performance is entirely bereft in these respects, but there is a looser rhythmic sense and more subdued use of dynamics than we’d like at this price. It reflects the presentation of Bluesound’s wireless speakers in this current suite, which is disappointing when you consider the aptitude the company displayed across the range in previous years. But it’s a compromise we’re sure many will be willing to make, especially considering the breadth of features and connectivity on offer with the Pulse Soundbar 2i. If you want a multi-room soundbar of this size with hi-res audio compatibility, it isn’t just that your hands are tied: Bluesound here offers a generally positive and entertaining performance. It isn’t in quite the same class-leading category as some of its Generation 2i stablemates, but the Pulse Soundbar 2i should at least make your shortlist.